Fake Weed, Shotgun, and a Sleepy Driver, GOODRICH, January 19, 2013 - On January 18, 2013 at approximately 7 a.m. Deputies Glen Edwards and Mark Dubose with the Polk County Sheriff’s Office were dispatched to Polk’s Pick it Up south of Livingston in the Goodrich area on U.S. Hwy 59. The deputies were responding to a call regarding a vehicle parked at the front doors of the establishment since around 4:00 a.m.
Deputies Edwards and Dubose made contact with the driver who was identified as Cameron Scott Mosley, 23, of Livingston. Mosley was apparently tired and stopped at the store for a nap. 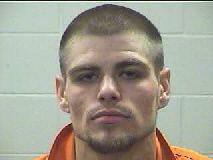 While speaking with the Deputies narcotics and drug paraphernalia were seen in Mosley’s vehicle. Mosley was placed under arrest. While completing an inventory of Mosley’s vehicle a large quantity of synthetic marijuana was located in the vehicle. Narcotics Detective Vance Berry was called out to investigate the scene. After the investigation nearly 8 pounds of synthetic marijuana was recovered from the vehicle along with a twelve gauge shotgun. The synthetic marijuana carries a street value of around $17,000.00. Cameron Scott Mosley was charged with felony manufacture/delivery of a controlled substance and possession of a firearm by felon (also a felony). Around 8 lbs. of synthetic marijuana (fake weed) was found in Mosley's vehicle.